Many know about the print version of The Upper Room, but they also have a great online presence. Check it out at https://www.upperroom.org/devotionals. 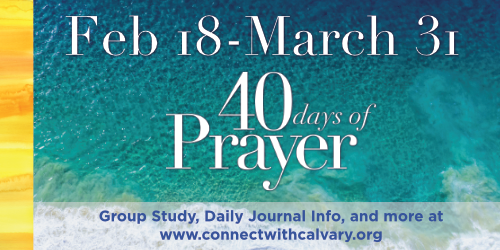 The Daily Connection during Lent will follow the 40 Days of Prayer Journal which can be found here. We encourage you to get one and connect with Calvary in prayer over these next forty days together. All our lives we have been taught to make others proud, to be proud of ourselves, to hold our heads high -- all the while missing the virtues of being poor in spirit. In light of the peace that Jesus brings in the middle of our storms, may these prayers of peace help you pray this week. 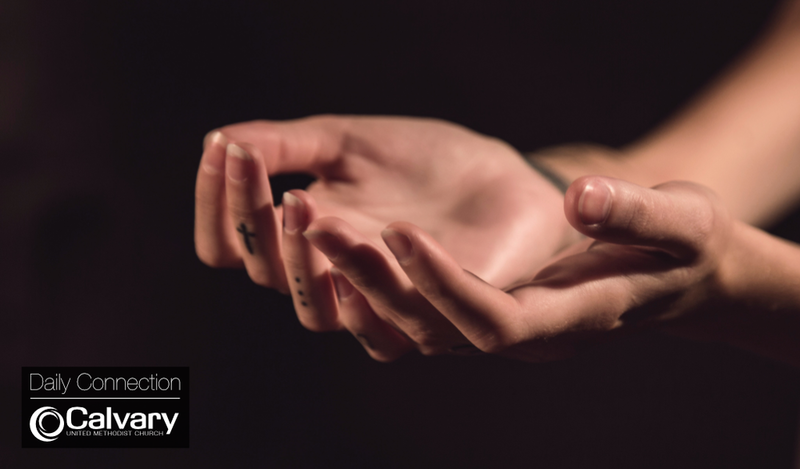 Check out this week's guided prayer experience here. "Today read again John 1:6-8. Make a list together of the things that bring light to our lives and make us joyful. Paint or draw a picture of something that makes you joyful." Spend a moment or two praying through our Psalm for the week today. Stop and ruminate on phrases that ignite your spiritual curiosity, and pray for the union of righteousness and peace. Psalm 85, verses 1-2 and 7-13. If you haven't yet explored the 2017 Advent Home Worship devotion guide, please head over there and prepare for the coming of Jesus. Remember, the dates will be one week off (the guides will show one week later than our worship services). While Augustine was pretty up-front with his "…not yet" request, our "not yet"s often remain submerged below the waterline of our consciousness. Understanding what self-control looks like (in our rational minds) and having the desire to enact self-control are different experiences. As you pray today, ask God to shape your desire for the fruit of self-control – ask God to turn your "not yet" into "your kingdom come." Unnecessary comparisons seem to be increasingly amplified in our times (even through casual use of social media and group gatherings), but Paul reminds us that our life in the Spirit is not measured against each other – “Each of us is an original.” Prayer is a wonderful place to begin celebrating your unique and original experience in the life of the Spirit. We often pray for things to change in prayer, but in this instance, the Spirit calls us to embrace what we have in front of us – continuing to unleash the Spirit-powered life offered through God. In recovery programs, the “serenity prayer” is often used to jump start this kind of contemplation in our lives. It’s a short prayer that can be used throughout your day to anchor you back to your identity in God. If you haven't yet incorporated this into your prayer habit, give it a try today. Sometimes it's helpful to pray with the assistance of a piece of poetry or music. The hymn "Of All the Spirit's Gifts to Me" is a good way pray through the influence the Spirit has on our lives. You can find the text here and background info here. One way to keep step with the Spirit is to get into a prayer rhythm. Last Wednesday, Carroll Bross mentioned an app she uses to help her stop and take short moments during the day to pray. If you don't have a practice like that already, the Honor Your Inner Monk app (iOS and Android) is a great way to get started. It's easy to use and fits into even the busiest of schedules.